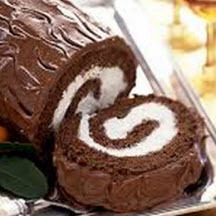 Making a festive Yule log cake is a fun tradition for many families at Christmastime. Heat oven to 375ºF (190ºC). Line a jelly roll pan, 15 1/2 x 10 1/2 x 1-inch, with aluminum foil or waxed paper and grease. In a large bowl, beat eggs with electric mixer on high speed about 5 minutes or until very thick and lemon colored. Beat in 1 cup sugar; water and 1 teaspoon vanilla on low speed. Add flour, baking powder and salt, beating just until batter is smooth. Spread batter evenly in prepared pan. Bake for 12 to 15 minutes or until toothpick inserted in center comes out clean. Immediately loosen cake from edges of pan and turn upside down onto towel generously sprinkled with powdered sugar. Carefully remove foil. Trim off stiff edges of cake if neccessary. While hot, carefully roll cake and towel from narrow end. Cool on wire rack at least 30 minutes. Beat whipping cream, 2 tablespoons sugar and vanilla until stiff. Unroll cake and remove towel. Spread whipped cream mixture over cake. Roll up cake. For Frosting: Mix cocoa and butter thoroughly in medium bowl. Beat in sugar with electric mixer on low speed. Stir in vanilla and hot water. Beat until frosting is smooth and spreadable. To create a tree stump, cut off a 2-inch diagonal slice from one end of cake roll. Attach stump to one side using 1 tablespoon frosting. Frost log making strokes in frosting to resemble bark, using tines of fork.